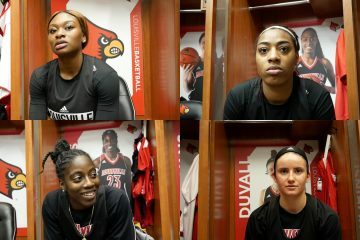 It’s back to action for the #2 ranked Louisville women today in Blacksburg, VA prior to a well-deserved week of rest. The Cardinals (21-1, 9-1) have now rattled off eight straight wins since the disappointment in South Bend, including wins against UConn, Florida State, and most recently Syracuse. The question now becomes, what’s the ceiling? The ACC tournament is now less than a month away, and battles against Miami and NC State loom on the horizon. But this is a Cardinals team that’s taking it one game at a time. Today they take on a Virginia Tech (15-7, 2-7) team in the midst of a turnaround, seeking their third straight conference win after losing the first seven. Seniors Taylor Emery and ACC Player of the Week Regan Magarity lead the way for the Hokies with ACC Rookie of the Week Dara Mabrey not far behind. Virginia Tech is a team whose record belies their talent, so the Cardinals will need to be on their toes. 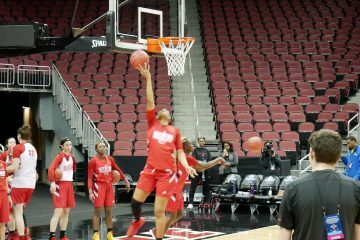 The Cardinals’ pressure defense has served them well, shutting down or limiting dangerous offensive teams such as UConn and Syracuse. They’ll need that yet again against a Hokies team averaging around 25 three-point attempts per game with a 38.2% success rate and a best in the league 9.5 made threes per game. Freshman Dara Mabrey is the standout, leading the NCAA with a 48.7% accuracy rate on an average of five attempts per game. The Louisville defense should limit the opportunities for Virginia Tech, but a response in kind would be no issue for the Cards if needed. The Hokies and Cardinals are nearly knotted at #1 and #2 in the ACC for three-point baskets and accuracy. 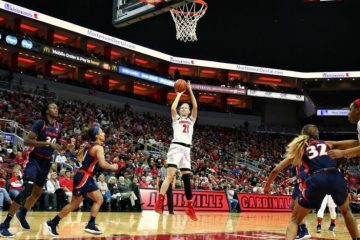 Asia Durr, Dana Evans, and Arica Carter have been the primary contributors to a Louisville team averaging 11 made three-pointers over the past four games with a nearly 40% accuracy rate. So even if the perimeter defense fails, the Cardinals can answer blow for blow. The Cardinals’ post play has been stellar over the past several games, and a continuation would be helpful. Louisville and Virginia Tech match up fairly evenly on paper in terms of size and statistics in most categories. Unfortunately for the Hokies they spent their first seven conference games up against six top 30 RPI teams, with five of those ranked in the AP Top 25. So, despite the record, Virginia Tech cannot be overlooked. That’s especially true for senior forward Regan Magarity and her ACC-best 12.5 rebounds per game. Fortunately, the effort from Sam Feuhring, Kylee Shook, and Bionca Dunham has been something to behold as conference play has progressed. A team averaging 37.9 rebounds per game on the season has averaged just above 46 over the past four games. Those three Cardinals are combining for an average of about 25 points and 14 rebounds per game. Not too shabby. Keep it up, and the winning streak may continue. As the season has progressed the Cardinals’ fouling rate has dropped precipitously. By any standard that’s a good thing, but it’s particularly helpful against a Virginia Tech team shooting a best in the ACC 79.2% from the free throw line. 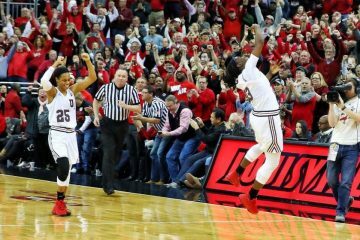 Jeff Walz often talks about (or rather dances around) the fact of inconsistent officiating. But he also wisely points out that you can mitigate the impact by not serving up easy calls on needless fouls. It’s been a good trend for the Cardinals of late, and continuation of defending without fouling will be a key to victory over the Hokies. It’s Play4Kay Day in Blacksburg. The Cardinals will host their own next Sunday against Miami. The Cardinals are 20-17 overall against the Hokies, and 5-0 since joining the ACC. Man Cardinals fans will, of course, recall the good old days of Metro Conference match-ups. The rivalry simply took a 20 year hiatus. 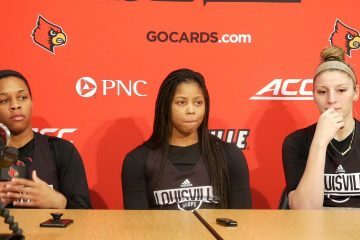 Your source for UofL Women's Basketball + Men's/Women's Soccer news via the The Crunch Zone. If I'm not at a UofL game you can find me at a Louisville City FC game, or doing Men's Basketball post-game on ESPN680/93.9 The Ville with my man Joe Kelly. Husband, cat owner, sports consumer.